Last weekend, a group of Matt McGuire’s AP Comparative Government students left for the United Kingdom. We got a note from Mr. McGuire yesterday evening about some of what they’ve been up to. “Today in the Parliament, we met with former Conservative Party Leader Iain Duncan Smith to discuss his actions in the House of Commons to compel the UK to leave the EU. 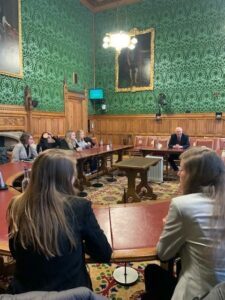 Then we met with former Labour Party Leader Neil Kinnock to discuss why Brexit constituted what he called, ‘The greatest act of national self-harm in British history. '” Tomorrow they will visit the Welsh National Assembly in Cardiff. What an amazing opportunity for students to meet with British leaders of such high stature to discuss one of the thorniest international political issues of our time. An enhancement grant from the Foundation offset the cost of this trip for all students attending. The 2018-19 Annual Fund supports all of our enhancement grant programming.